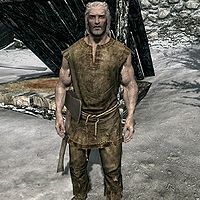 Thorald Gray-Mane is a Nord and a strong supporter of the Stormcloaks. The Thalmor have abducted him and are keeping him captive in the dungeons of Northwatch Keep. His brother Avulstein will task you with finding him. Once you rescue him, he will go into hiding. His mother is Fralia Gray-Mane. He wears a roughspun tunic and a pair of footwraps. Sometimes, before starting the quest Missing in Action, Thorald can be found in Northwatch Keep; however, it is not possible to rescue him if the quest did not initiate or reach the point where you have to save him. Instead of his usual dialogue, he will continually ask what you are doing. This page was last modified on 30 December 2017, at 17:16.